Available on The Information and 3 other releases. Available on The Information Album Sampler and 1 other release. Available on Aphids On The Lettuce. Beck has said they whittled away at songs over a few years in creating The Information, and looking at the early live version of "Cellphone's Dead" indicates how they did this. He re-wrote the chorus, but kept the melody, and added some killer production beats, but otherwise it's the fairly similar to "Knock Out." The final version sounds fantastic, and displays a very high level of work. All the sections blend and flow brilliantly. The song begins with a very cool jungle-y beat, a great intro, one that catches the listener. The song then goes into the verse and choruses, Beck rapping over a slow bassline. A few sounds fill it out (some beautiful piano, Beck's baby son saying hi), but it remains quite minimal. The second chorus has more going on, mainly synth effects. And in between the second verse and chorus, the intro beat pops up unexpectedly. After the second chorus, a long outro takes off--a highlight of the song (and the album), if you ask me. (I know you didn't.) It begins with some turntable scratching and piano, which mix beautifully together. Yes! Then Beck chants about the "eye of the sun" (a line from earlier in the song) before a cello and percussion section get the groove going again. A choir of Becks build to the end of the song. Lyrically, the song reminds me a great deal of "Elevator Music," a couple of songs earlier on the album. Both seem to be exploring that feeling of being down ("strange ways comin' today," "let-down souls"), and combatting it with music (the whole second verse here reminds me of a "Where It's At"-like party/rave situation). There is an touch of sadness to the party, with people there "just to say that they did it," and comparing the situation to a treadmill going nowhere. Also, everyone's double-parked. The chorus seems to be hinting at the idea of being let down by modern society ("cellphone's dead / lost in the desert"), and being unable to find that connection you need (literally and figuratively). The rapped verses indicate that this connection is music, the easiest way to "comb your worries (and fix your thoughts)." As Beck sings, "let-down souls can't feel no rhythm," so heal your soul by digging the rhythm! "Cellphone's Dead" is a fun song, but also one that looks at social connections via music and technology, through a slightly sci-fi landscape. It is quite analagous to the main themes of The Information in that way. 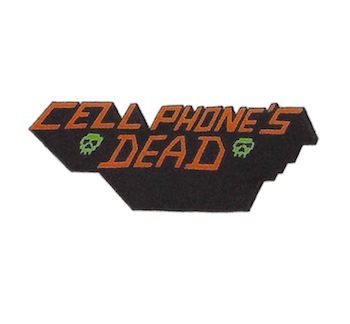 Somewhat surprisingly, "Cellphone's Dead" did not ever become a full-on regular in the sets for very long. It does have a very interesting life on stage though! This song made its premiere as an unreleased song during Beck's "secret" shows prior to the release of Guero. It has a nice relaxed feel to it on stage. At this time, the song was known as "Knock Out." The song consisted of the two rap verses, an early version of the chorus, and the main bass riff pulsing throughout. The little intro and bridges and ending as on Info weren't written yet. Because of that the song is much more pure hiphop (it did have some turntable scratching going on, I think, by Beck). After these warm-up shows, Beck went on tour behind Guero. Since "Cellphone's Dead" wasn't part of that album, the song dropped out. It does show up on some setlists over the rest of 2005--but usually either more "secret" shows, or if Beck adlibbed some "Cellphone's Dead" lines for fun. After finishing up Guero tours, Beck took 5 months and finished Info (he had begun that album prior to Guero), which was released in October. He resumed touring in May 2006 and over the summer couldn't help but dip into some of the Info songs on occasion. March 22 2007 saw a warm-up tour show in LA (before heading to Australia and Japan). The "Cellphone's Dead" was more bluesy in nature, and Beck less-rapped than sang the lyrics in a random, nonflowing kind of way. Here is yet another version from Australia in March 2007, where Beck just did a one-chorus version of "Cellphone's Dead" before it morphs into "Hell Yes." He says at the end that it was "impromptu." April 6 2007 again saw a return to the Kraftwerk version, though it came fully tacked on to a jam with "Cars" and "Think I'm In Love." This version kills! April 9 was back to normal, but short--Beck starts with the chorus, before chatting the Mr. Microphone verse (it's not really rapping, nor singing), before doing the chorus again and stopping. "That was a good one," Beck says. OK.
Beck hasn't played this since the Info tours. It was reported at one show in October in 2008, but don't have a boot to verify, and otherwise hasn't been reported or heard (so I'm skeptical that this report was accurate). There are also reports of 2 remixes of "Cell Phone's Dead" by musician Girl Talk, neither of which have been released yet. Beck asked Karen O from the Yeah Yeah Yeahs and MIA to do the "one by one I'll knock you out" part, but neither could do it. Instead he used his niece, Lucia. Strangeways, Here We Come is the name of an album by The Smiths, whose lead guitarist plays on "Milk & Honey." Strangeways is the name of a prison in Manchester, UK (where The Smiths are from). The prison is notorious for executions and riots. Whether Beck is referring to that, or just literal strange ways, I am not sure; both seem to fit the song.